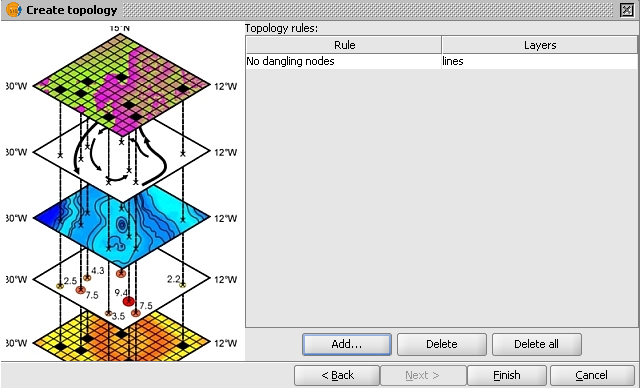 It is quite straightforward to flag dangles (or free end points) using the topology tools in gvSIG. Simply create a new topology rule to check for dangles on a linear layer(s), then run the validation. All the dangles would be flagged out as error points on the map. 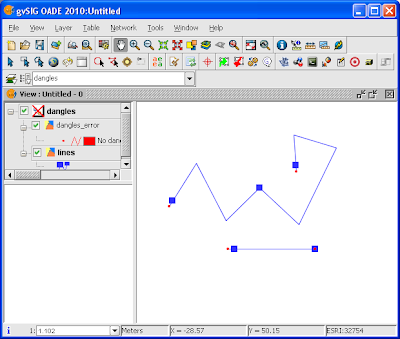 Run gvSIG OADE 2010. 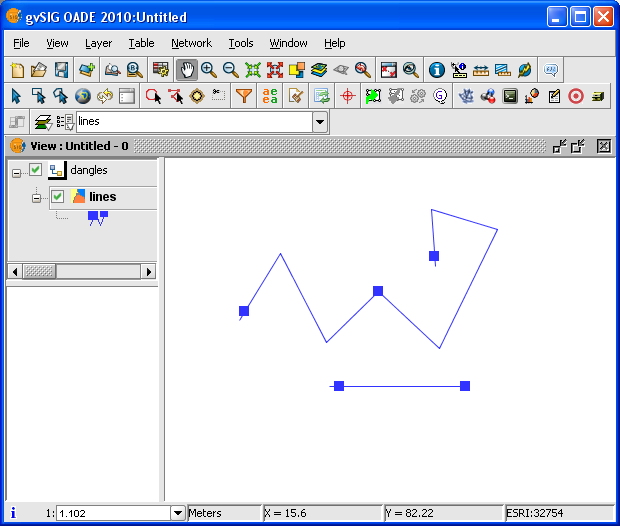 Load and display a line layer e.g. lines.shp in the Map View. 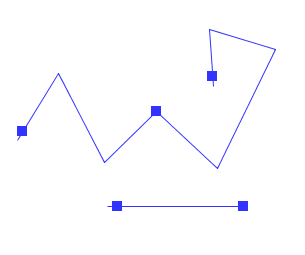 Note: the blue rectangles indicate the end points of the line segments for illustration purposes only. 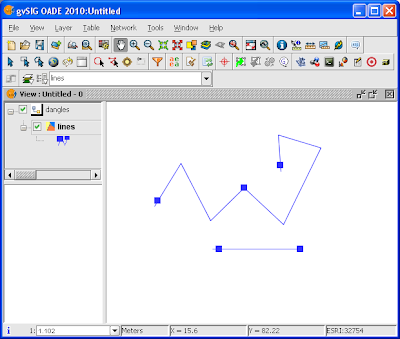 Select Tools | Topology | Create Topology. 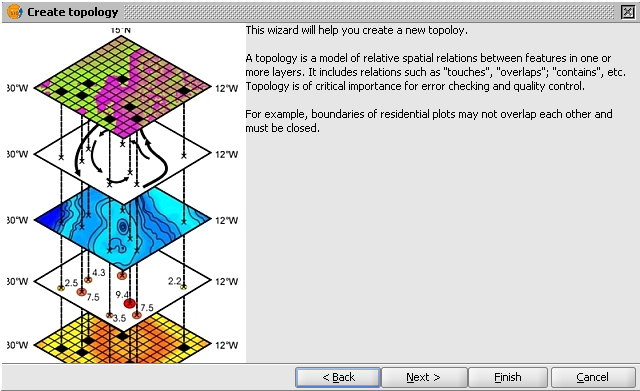 The Create topology wizard appears. In the Topology name field, type in a string e.g. dangles. In the Cluster tolerance field, key in a value e.g. 1. In the Maximum number of errors, key in a value e.g. 20. Under the Layers to include in topology list, toggle on a layer e.g. line.shp. Click Next. The Topology rules dialog box appears. In the Topology rule drop down list, choose All line geometries of A must be free of dangling nodes. Click OK. The rule is added to the list. A new group named dangles is added to the TOC (legend). In the legend, click the group dangles. Select Tools | Topology | Validate Topology. 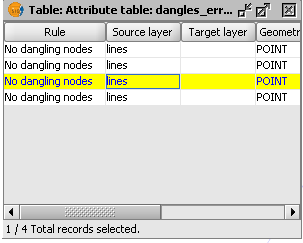 A new layer dangles_error is created under the dangles group. The dangles are flagged in the Map View. Optional. 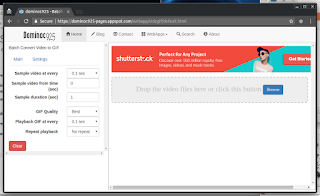 Click on the dangles_error layer in the legend. Select Layer | Show Attribute Table. The Table: Attribute table:dangles_error dialog box appears. dominoc is a Geographer working in a small technology company. You can send him an email at this location.